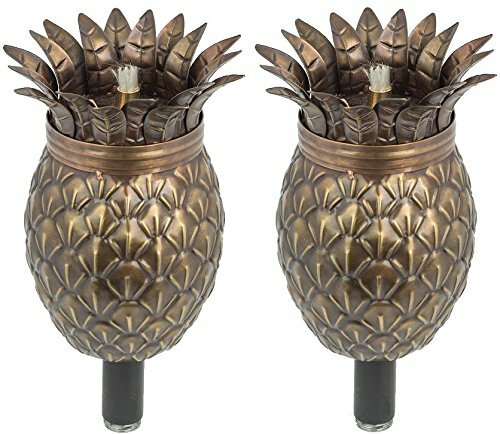 Infuse your outdoor bash and create a fantastic atmosphere with the best outdoor Tiki Torches reviewed by us. You can outline the boundary of your next party and create a great summer vibe. Whether you are hosting a function for a wedding, cocktail, or having a friendly gathering—each one will keep your festivity lit. To set the right mood at any festivity needs special planning. 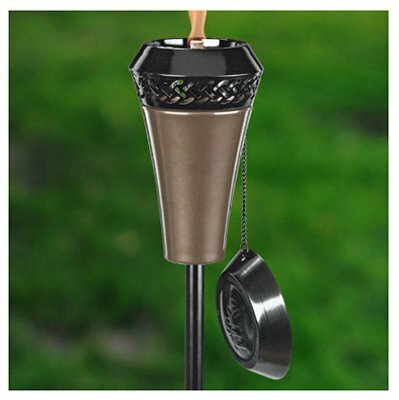 With the Tiki Swirl Metal Torch, you can add lighting and spontaneity to your patio or backyard. The TIKI Brand offers you a natural flame blue glass canister torch. The cylinder has a spiraled metal structure around it. Assembling the product is easy with the four-piece assembly. 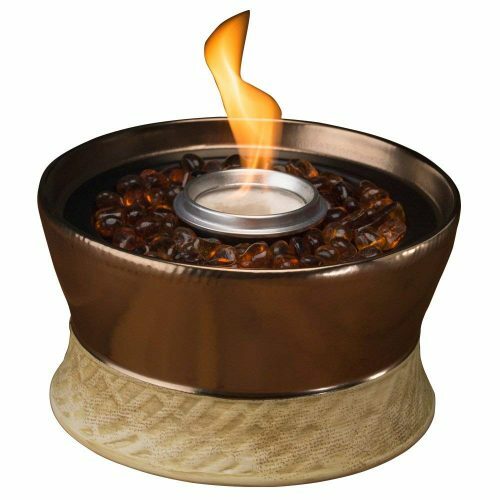 You can use it with lamp fuel or citronella oil. 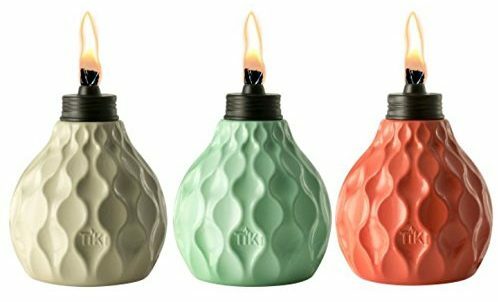 Set your party aglow with the Tiki Island King Torch. With the polished and refined look, they will uplift the mood of any visitor. The massive wick produces a large flame. For ease of filling, it has a twist and pours function and include a metal snuffer. Assembling the item is a breeze with the four-piece construction. Instead of placing Tiki Torches everywhere around the backyard—take it to your table. The Clean Burn Fireplace Torch has a round wick burning system that burns for hours. With the earth tones and bronze design, it looks great as a centerpiece on a table. The burner is reusable and presents less smoke. During the summer, there is no better place than to dine outside. You may have heard friends saying you can make your buffet spectacular with some Tiki Torches placed in the ground. We have something even better—the Marine Votive Outdoor Table Torch. The trio lights up any patio dining set to create the right atmosphere. You do not need the 4th July to have a party—you can celebrate at any time with the Americana Bamboo Tiki Torch Collection. 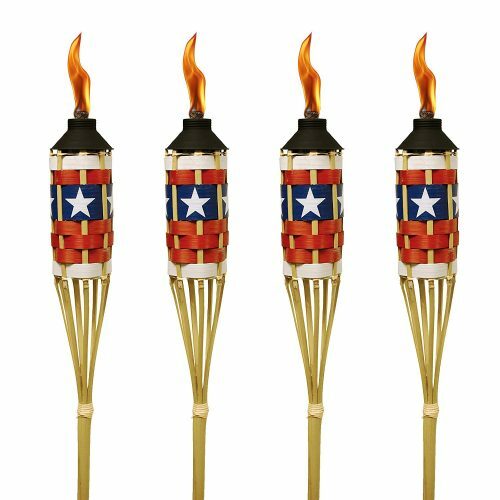 The natural outdoor torches will help set the right patriotic mood and adds fun to any party décor. You can place them in the garden and you get four of the torches in the pack. If you prefer not working with fuel to light the Tiki Torches, you can enjoy using these solar powered ones. There are two torches in the package and comprise plastic. They charge up from the sun and flickers at night always creating the right mood outside for a party. You can purchase them in a pack of four as well. 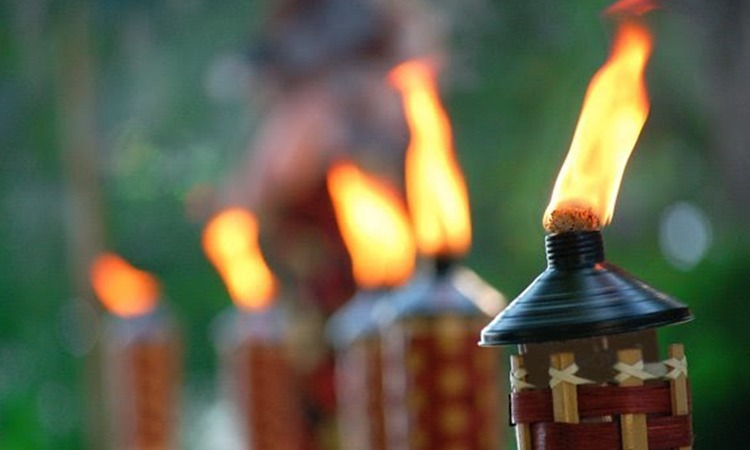 If you entertain all year round, you need the following Tiki Torch. The ORCHOS has a stainless steel structure constructed to last. The fuel basin burns up to eight hours and the wood, steel structure looks great. The maximum fuel capacity is 10 ounces. You need an elegant Tiki Torch to place in your backyard, look at the Island King Flame here. There are twelve of them in a pack and holds up to five times longer than using a traditional torch. A standout is the twist and pours feature for ease of filling. The fiberglass wicks burn longer even in the wind. Bring some metal art onto your patio or in the garden with the Saguaro Cactus. The product is rust-resistant and has a green patina finish that makes it look realistic. The cactus fits in with any garden theme and only needs lamp oil to work. You can enjoy a subtle atmosphere close to the patio for up to six hours when lit. 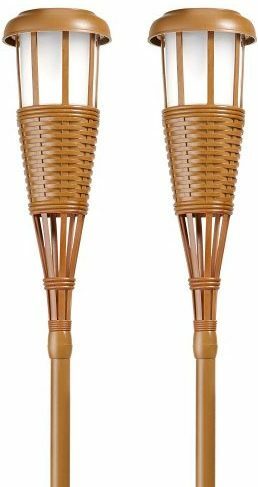 With the top 10 best Tiki Torches reviewed here—you can create a fantastic atmosphere for any outdoor event. With the lamp oil use and easy mount into the sand with the poles, you can take them anywhere. If you prefer not using oil, you can always consider buying the solar powered one.